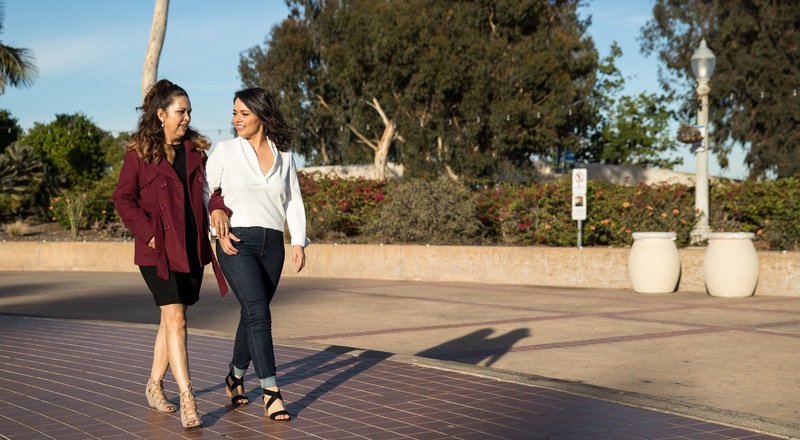 High tech, high touch: Thanks to advanced technology, Carolina Aceves (right) was able to donate a kidney as part of a series of donations that brought her mother, Olivia Santillan (left), the kidney she needed. That experience has made Aceves, a member of OPEIU Local 30, a passionate champion for workers who want to develop their skills so they can better serve our patients and communities. For Carolina Aceves, technology and health care go hand in hand. Shortly after completing a new online digital fluency course for Kaiser Permanente employees, she saw firsthand how technology can transform a life. Her mother needed a kidney transplant, but neither she nor her siblings were a match. In October 2017, however, in a series of matches orchestrated through a national computer system, she donated a kidney as part of a chain of donations that resulted in her mother receiving a kidney. In December, she returned to work at the California Service Center in San Diego, where she is an account administrative representative, fielding calls from KP members and answering their questions. She also chairs a young leader council for OPEIU Local 30 — and is leveraging that role to mobilize all represented members of her unit-based team, urging colleagues of all ages to take the digital fluency course. Digital fluency is one of four critical skills that will be essential in the health care of the future. The new online program, which helps participants understand the role of technology in health care, is free to workers represented by a union in the Coalition of Kaiser Permanente Unions through the Ben Hudnall Memorial Trust, the SEIU UHW-West & Joint Employer Education Fund, and National Workforce Planning and Development. The national workforce office also is developing programs for the other three critical skills — consumer focus, collaboration and process improvement — as part of a larger strategy to encourage employees to upgrade their skills, advance their careers and meet the changing demands of health care. Digital fluency skills are good for workers, KP members and the organization, says Jessica Butz, the coalition’s national coordinator for Workforce Planning and Development. While some may fear technology will eliminate jobs, the push at KP is to use it not to replace workers but to enhance the care and service they deliver. He asked me, ‘Are you a doctor?’” I said, ‘No, I’m a medical assistant.’ It made me feel 10 feet tall, and I’m only 4-foot-10. Abelene Cerezo-Kirtley’s experience demonstrates how empowering the digital fluency course can be. A 19-year Kaiser Permanente medical assistant at the Sacramento Medical Center, she used to fear computers, but not anymore. Inspired by her 84-year-old father and his love of learning, she took the digital fluency course. She found it made her more comfortable with technology, enabling her to provide better care for her patients — and her family. She created a spreadsheet to track her father’s insulin injections, consolidated his medical records on an iPad (he’s not a KP member) and presented it to his physician. Cerezo-Kirtley’s manager, Jennifer Henson, RN, encourages her staff to upgrade their skills. “It’s important to support our staff to advance themselves, which in turn promotes the health of the company,” Henson says. United Steelworkers Local 7600 President Janis Thorn praises Kaiser Permanente for working in partnership with labor and urges employees to prepare for the future by participating in KP’s education programs. Aceves, who aspires to work in community health, shows how such skills enhancement can have broad benefits. The digital fluency course was eye-opening, she says. Having seen how health care technology improved her mother’s life, she wants to raise awareness about the possibilities — and the need for kidney donors. Kaiser Permanente has identified four critical skills that will be essential to the future of health care. The online program in digital fluency will be followed by programs in the other three skills. Learn more at kpcareerplanning.org. Find great resources on this website (see links below). the Ben Hudnall Memorial Trust or the SEIU UHW-West & Joint Employer Education Fund to sign up for the four- to six-hour course. Consumer focus. Consumers expect convenience, personalization, service and quality. Learning how to engage and connect with members can help employees deliver great care and great outcomes. Get tools for incorporating our members’ and patients’ viewpoints in your team’s work. Collaboration. Sharpen your team-building skills. Solve problems together, respect others and drive continuous learning. Download these ideas for getting everyone in your unit actively involved with your team. Process improvement. Find ways to increase quality and save time and money. Get our how-to guide on performance improvement. For another look at Cerezo-Kirtley’s story and the power of digital fluency, watch this short video. Download this flier to spread the word about opportunities to improve your digital fluency.